July 08, 2018 at 10:37 pm. SAN FRANCISCO — Two teams exhausted after generally successful series don’t get a break when the Chicago Cubs and San Francisco Giants open a three-game set on Monday night. The Cubs needed late rallies to sweep two weekend games against the Cincinnati Reds, a last-place team that stubbornly had beaten the defending National League Central champions five straight. Chicago headed west after a 7-1 homestand, but having surprising struggles with its starting staff. 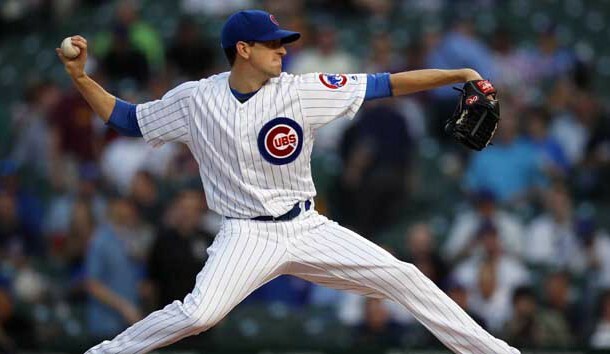 Right-hander Kyle Hendricks (5-8, 4.27 ERA), who won a combined 23 games the past two seasons, will take the mound in the series opener looking for just the second win in his last eight starts. Hendricks pitched seven strong innings in beating the Giants 6-2 in May, but has since fallen upon hard times, watching his ERA climb from 3.16 to 4.27. He has never won in San Francisco in three career starts, but he does hold a 3-2 overall record and a 3.06 ERA against the Giants in six starts. Hendricks will have to deal with a Giants team coming off a season-best offensive performance in a 13-8 victory over the St. Louis Cardinals that salvaged a hard-fought split of a four-game series. Pablo Sandoval homered and drove in a season-best five runs in the win, which allowed the Giants to avoid losing a home series for the first time since April. Brandon Belt collected five hits, including two doubles, and three RBIs in the two weekend games against the Cardinals. He has had more than his fair share of success against Hendricks in their career head-to-heads, going 5-for-14 (.357) with a triple, home run and three RBIs. The Cubs, meanwhile, have never seen Giants starter Andrew Suarez (3-5, 3.92), who has lost just once in eight starts since May. The rookie has pitched so well in his last three starts — allowing just three runs in 18 2/3 innings — that he was able to retain his spot in the rotation despite the fact the Giants welcomed back Johnny Cueto and Jeff Samardzija from the disabled list last week. Cueto will pitch the second game of this series, squaring off with Cubs left-hander Jose Quintana. Javier Baez, voted into a starting spot in the All-Star Game, was the driving force in the Cubs’ 8-7 and 6-5 wins over the Reds. He totaled six hits, including a double and a homer, and two RBIs. Baez hit homers in each of the final two games when the Cubs won two of three from the Giants in May in Chicago. Both teams enter the series with a key player questionable. Cubs third baseman Kris Bryant has missed the last 14 games with inflammation in his left shoulder. He hopes to return from the disabled list at some point during the team’s weeklong trip, which concludes in San Diego. The Giants, meanwhile, had to remove outfielder Gorkys Hernandez from Sunday’s win with tightness in his left calf. Hernandez had two hits and drove in two runs Sunday as the Giants set a season high for runs.